For the third year in a row, Calaveras Community Foundation (CCF) has received a generous $5000 donation from Save Mart Supermarkets. 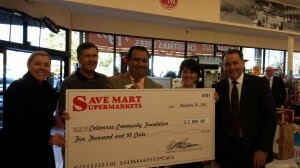 Executives from Save Mart Supermarkets presented the check to Foundation Board members as shown in the photo below. These funds benefit the Career and Technical Training (C&TT) Scholarship Fund. At this level of donation, Save Mart moves into the ranks of a corporate partner and CCF is most grateful for Save Mart’s continued support. “Here at Save Mart, we fully believe that it’s important to invest in the future and we are proud to be a part of that by participating in raising funds for the Career and Technical Training program. It offers education alternatives to high school graduates, building a foundation for the communities’ future.” states Dan Kohnen, Store Manager, Angels Camp Save Mart. Save Mart Supermarkets believes strongly in giving back to the communities they serve. The C&TT scholarship fund, founded in 2010 and administered by the Foundation, is based on the belief that high school graduates need to have options in pursuing training or further education aside from the traditional four-year college. A wide range of opportunities exist in our region for youth seeking associate degrees and certificates leading to good paying technical or vocational career paths. Scholarships awarded in 2013 benefited eight high school students from both Bret Harte and Calaveras High Schools. Each recipient received $1200. A wide range of fields of study for these students include: court reporting, diagnostic imaging, heavy equipment, fire service, medical, mechanics, electrical lineman, and agriculture. Continued generous donations like this from Save Mart help raise the consciousness of other local business partners in assisting the youth of our community. As these and other funds continue to grow, CCF will be able to award more and higher dollar scholarships to C&TT applicants. CCF, a 501 C 3 non-profit organization, welcomes donations from like-minded businesses and individuals who see the challenge ahead of making scholarship funds available to students pursuing technical or training career paths.